SAN MATEO, Calif.--(BUSINESS WIRE)--Jaunt Inc., the global partner of choice for producing and distributing immersive content, announced today the acquisition of Personify’s Teleporter line of business, including key staff, IP, and pending patents. Personify is an augmented and virtual reality company with a product line of applications for streaming immersive video. 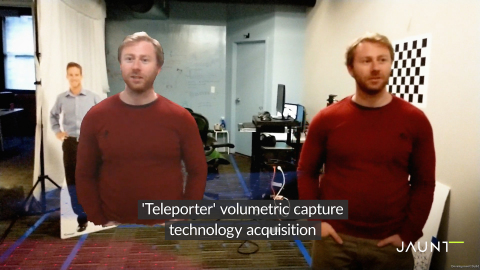 This includes Teleporter, a volumetric streaming software system that captures, processes, and streams life-like AR assets in real-time. The talent and IP-driven acquisition will directly support Jaunt's recently announced volumetric research and development initiatives for the Jaunt XR Platform, a B2B solution that enables partners to distribute augmented, virtual, and mixed reality assets through their own applications and channels. Jaunt’s proprietary approach to volumetric content utilizes a low-profile capture stage and real-time processing, leveraging the Jaunt XR Platform’s existing streaming technology for delivering high-quality VR and AR experiences. Jaunt focuses on building business-ready solutions for creating and sharing next-generation immersive content, with an emphasis on supporting mobile content delivery channels and providing portable, affordable, and scalable creation tools. The seven Personify engineers joining Jaunt’s R&D team will continue to drive these efforts forward. Simon Venshtain, Personify CTO, will become Director of Research, reporting to van Hoff and leading the new Chicago-based team. In addition to new talent, Jaunt acquires four pending patents developed around Personify's Teleporter technology and expands its footprint by taking over the Personify office in Chicago. Jaunt is the leading XR solutions provider, helping partners produce and distribute the full spectrum of immersive content (virtual reality, augmented reality and mixed reality). Through its full-service global production house, Jaunt Studios, and the Jaunt XR Platform’s state-of-the-art distribution technology, Jaunt enables companies to leverage XR to tell their stories in the emerging immersive age. Jaunt is a two-time selection for Fast Company’s World's Most Innovative Companies and back-to-back selection for CNBC’s Disruptor 50 List. Headquartered in San Mateo, California, the company maintains Jaunt Studios in Los Angeles, an international headquarters in London, and a sales office in New York. In 2017, Jaunt established Shanghai-based Jaunt China, formed in partnership with Shanghai Media Group (SMG) and China Media Capital (CMC).